Eric Idle is perhaps the most famous of the six. He is the most associated with Spamalot. 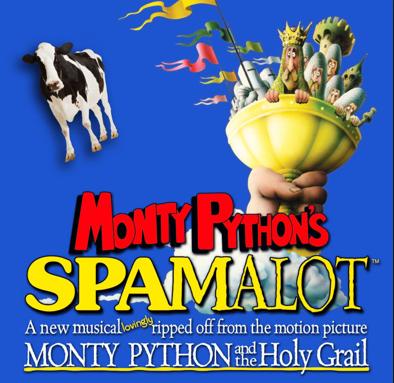 Spamalot is a classic musical stage-performed show that was based on the popular Monty Python and the Holy Grail – the most flourishing Python feature films.nnAs a tribute to the stage show and a throwback to the “good old times”, Playtech developed Spamalot online slots. The slot game incorporates most of the original elements of the stage show into one fun game that will be enjoyed by everyone regardless of the age.nnIt will be hard to single out a boring characteristic of the slot game. Starting with the symbols and ending with the progressive jackpot, everything is just fun. The lower value symbols are, of course, the traditional 10, Jack, Queen, King, and Ace but the higher symbols are characters drawn from the original show. The characters making an appearance in the slot are; Lady of the Lake, Sir Lancelot, King Arthur Sir Galahad and Sir Robin. The Holy Grail symbol plays wild while the official Monty Python logo is the scatter symbol that promises huge bonuses. The game has four exciting bonus games. The bonus games are different, but they are progressive such that they follow each other- you survive one in order to be ushered to the next. All the bonus games are triggered when you land bonus symbols on the first and fifth reels. The Knight will shuffle six prize circles and reveal a prize. The French man in the circle will then throw a cow at you, and you must do everything to avoid being hit otherwise you are dead! And so is the game. Your aim is to fight the Knight. Chop a limb off him, and you get cash bonuses. Miss and you multiplier will reduce by one for every miss. You can only have five consecutive misses. Here you can sell a shrubbery to the Knights for a cash prize. Your objective here is to guide your knights across five rocks. On one of the rock, there’s a killer rabbit. The player begins by throwing a grenade at one of the rocks to guide one knight. If you hit a rock with a rabbit, all the knights will cross safely. Each Knight that crosses earns you a cash reward. If you land three or more scatters on any point of the reel, you earn yourself ten free spins. For every free spin, you have 1-5 wild symbols distributed on the reels to make the game fun. You also get a chance to win entry to the jackpot game.